Why are businesses so reactive to loss prevention instead of being proactive? I know many business owners view security and loss prevention only as a “cost center” and fail to see the potential ROI. The fact is that if you open any type of business, you’re going to lose money directly or indirectly. Internally speaking, you cannot control the actions of people you know or hire to work for you. Nobody is perfect; therefore, you run the risk of people you may trust ripping you off. Externally, we know there are people who will stop at nothing from ripping people off, whether it’s information, products, or just causing damage. How can you be proactive about your physical security and prevent losses at your business without breaking the bank? Okay, first ask yourself, ‘What would it cost for me to be out of business for one day, week, etc?’ Probably a lot. Although it’s not inexpensive, a monitored alarm system will minimize the time an intruder has in your business and keep your employees honest. When was the last time the locks were changed at your business? Did you ever change them when you moved in? How many employees have you gone through since your locks were installed? Create an access log. Make sure to keep track of all key-holders and document the serial number on their key and the date they received it. Also keep track of their security code to your alarm system. Do you shut off ALL of your lights when you leave at night? Leave a light on inside, and install motion lights in front and in back of your facility, preferably above the doors. Make sure it’s secure and accounted for. Everything on the inside of your business has value. Remember, just the hassle of dealing with a break-in will cost you time and money because time is money. Vacation security is commonly the last thing on people’s minds when they are getting ready to leave town. But that lack of focus can make for a sour experience when they arrive home. This is the right time when you should firm up your plans for summer vacations, and take the right steps toward increasing and improving your home security methods. The best way to protect your home is think like a burglar. Criminals are constantly on the prowl for targets that look unoccupied. But also think like a Risk Manager. They are “on the prowl” to prevent losses. So, here are some tips to make your house less inviting to a burglar, and some ideas to prevent some home losses. 1. Do you have a home security system? If you don’t, Get one. 2. Are your plants and shrubs grown up and obscuring the windows or doors? Trim them down below the windows and away from doors. 3. Install deadbolts on every exterior door. Don’t go cheap, but install high quality hardware. 4. Buy programmable timers and plug in lights, TV and radios to mimic your normal routine. 5. Never store ladders and tools out in the open. Place them inside a locked shed or in the garage. 6. Install blinds on your windows and doors so you can prevent criminals from peering inside your house. 7. Get the lawn mowed regularly. An overgrown lawn is one of the first visual signs a burglar sees and tells him that perhaps someone is not home. 8. Install motion-sensor-triggered lights at door openings. Lights scare burglars. 9. Read your insurance policy and be certain that your coverage is up to date. 1. If you are on social networking sites like Facebook or Twitter, resist the temptation to announce to the world when you’re going on vacation. Criminals read social networking sites, too…and, trust me, you’re not that hard to find. If you tell everyone you’ll be gone the last two weeks in June, guess what might happen? 4. Can you afford a housesitter? That is someone who actually stays at your home while you’re gone. Housesitters can be the perfect solution if you’re going to be gone on vacation. They can water the plants, receive the mail and newspapers and take care of the pets. Many times, the cost of a housesitter is less than just the cost to board pets. But look at all the value you’d get for the cost. Sometimes you can get a trusted friend to take care of the house without actually staying in it. They can feed the pets, collect the mail and do the other regular things around the house. If you cannot afford a housesitter, or do not have a person to keep an eye on the house, then do the following below. 4. Notify the post office and ask them to hold your mail while you’re gone. Many people have mail slots at home, but why risk some type of post office mistake? A substitute carrier might not notice your schedule and deliver your mail. 5. Secure your important documents and valuables. Move financial and legal documents, expensive jewelry, family photos and such to a more secure location, like a large safe deposit box at a bank. If you’re leaving your computers at home, back them up onto a disk and put the disk in the safe deposit box. 6. Call the police and inform them of your vacation schedule. 7. If you have a monitored security company, call them and inform them of your schedule. Tell them who has authority to be inside your home while you’re gone. 8. Tell your neighbors you’ll be gone. Leave a key with a trusted neighbor. Ask them to watch your property. Tell them who is supposed to be there (housesitter, lawn service, etc.) Give them your contact information. Ask them to phone police if they hear your alarm system going off or see suspicious activity at your house. 9. Lower and close the blinds on ALL windows and doors. Lock all doors and windows. If you have a sliding door, place a door-width dowel in the door track to prevent the door from opening. 11. Unplug the garage door openers before you leave. Criminals can get descramblers that open garage doors. Then, they could open your garage door, drive into the garage, and close it behind them. 12. Forward your land line phone calls to your cell phone. 13. If it’s cooling season, leave the A/C unit running. Just set the thermostat at a higher temperature setting. An exterior compressor than never turns on would be a good sign to a burglar that nobody’s home. 15. Set the alarm system. Make sure the person taking care of the home has the security code and knows how to use it. Then, when you arrive home after the vacation, change the alarm code. 16. Print out this article and use it as a vacation security checklist. Then, have a terrific vacation! Check out Community Lock’s new email blast right here. Let us know if you have any questions. Rick Smith here at Community Lock & Safe Service, Inc. and I wanted to share with you one of the more commonly overlooked aspects of keeping your business safe from burglars. You may go to great lengths to make sure that your place of business is well protected; security cameras, lighting, well thought out safety procedures and so on. You might have installed a steel, aluminum alloy, or hardwood door with burglar resistant glass, non-removable hinge pins, and heavy duty multiple point long flush bolts. And you’re probably feeling pretty confident that you’ve done everything you can to keep your business safe. But believe it or not, even people who have gone to great lengths to ensure the safety of their business still frequently overlook something else that is just as important: windows and other smaller openings. To the burglar, they’re like your other front door. For some reason business owners often put all of their focus into having a door like a fortress and forget that there are other points of entry that burglars seek out. Windows are a major factor, but this also includes ventilation openings, air conditioning ducts, doors that lead out onto the roof, skylights, fire escapes, and crawl spaces. One weak point can make all of your other security efforts useless. All windows that open should have locking pins, bolts our latches on the inside, and should be secured at all times when they are not open for use. All windows should be protected with burglar resistant glass. Depending on your needs, you might want to consider installing grills, grates, bars, or even heavy-duty screening or Mylar on windows. Secure other openings such as skylights and vents with bars or grates. Community Lock & Safe Service, Inc.
PS – If you know any business owners who could benefit from this information, feel free to forward it to them. Beware of any estimate that is substantially lower than the others. It probably indicates that the contractor is not licensed, made a mistake or is not including all the work quoted by his or her competitors. You may be headed for trouble if you accept an abnormally low bid. It is also possible that this contractor will cut corners or do substandard work in order to make a profit on the job. In California, if a contractor has employees, they’re required to carry workers’ compensation insurance. The importance of this cannot be overstated. If a worker is injured working on your property and the contractor doesn’t have insurance, you could be liable to pay for injuries and rehabilitation. Your homeowner’s insurance may or may not cover those costs. You should check with your insurance carrier to make sure the workers’ compensation insurance coverage being provided by the contractor is adequate. Learn more from theCalifornia Department of Insurance. For a few days more… Huge Security Camera Discount! Folks, we have a huge discount on our security camera systems. Please click here for details! We just sent out our most recent email newsletter. Check out the information here. In it, you’ll see how scam artists are imitating locksmiths. This is information you can’t miss! Also, we’re looking for reputable sales folks. We’re hiring! Alarm systems are not your only defense when it comes to home security. Another line of defense is the lock system at your home’s entrance. This is why one of the first pieces of security advice that an authority would give you when you move into a new home or apartment is to change the locks. There are two main reasons for this. First, if your current door lock is not already a Grade 1 deadbolt, then it is imperative to make sure that you upgrade it with a Grade 1 lock. These are tested by the ANSI and are guaranteed to offer you certain quality standards over other locks. Second, you never know if someone else has a copy of the key to your door. Whether it be a former tenant or someone who was able to copy the former resident’s key, you will feel a little more peace of mind knowing that only you and/or your management has a copy of your key. To take things a step further you can look into something known as key control. This can help bolster home security because it limits who can make copies of the keys to your home. There are even some apartment landlords who use this type of system on the keys to their tenants’ apartments. Most of the time a key can be copied without consent of the resident. Having key control means that only you the homeowner or someone you have preauthorized can have duplicate keys made. Manufacturers of key control lock systems get utility patents. This controls the actual sale of their “blank” or uncut keys. When there is a utility patent it makes it illegal for any third party to cut a key for the patented lock, meaning that only locksmiths specifically contracted by the manufacturer can duplicate the key. A record keeping system ensures that no one but you and people that you specify can request a duplicate copy of a key. You never know who could have made a copy of a spare key–from a mechanic who temporarily held your keys while your car was being fixed, to fired help who used to work in your home, to ex-acquaintances who may have had a copy of your key in the past. In most cases, a person can go to a local retail or hardware store and get a duplicate made without permission from the original key owner. Key control is a great security measure that can help to prevent this. Remember, Community Lock & Safe Service is here for you. Patented Key Control – Most high security locks use a restricted key system. High Security Keys are patented and can only be duplicated by authorized locksmith dealers. These keys can even use signature verification to prevent the key from be duplicated by an unauthorized person. If you have ever handed your keys over to someone else (i.e. automotive repair, valet, house keeper, etc…) you cannot be sure that they didn’t duplicate your key. Most keys can be duplicated at a local hardware store for under $3 dollars. A high security key prevents this, and allows you to keep tight control on who has copies of your home or business keys. Pick Resistance – Standard locks can easily be picked just like you see on TV. Lock pick sets are easily obtained on the internet and with a little practice, you can be opening locked doors in a matter of minutes or sometimes seconds. High Security locks use numerous pick resistant technologies that prevent a person from picking the lock. Some of the pick resistant items can easily be seen on the high security key where others are hidden within the lock itself. Drill Resistance – Some High Security Lock Cylinders are specifically designed to resist a drill attack. Opening any lock is a simple as creating a shear line between the inner cylinder and the outer housing. On most locks, this can be done using a small drill and drilling a hole just at the top of the cylinder. It only take a few moments to drill a small hole in most locks. This creates a shear line and the lock can be easily opened. If you think no one knows this fact, think again. Criminals and thieves know this and use it to enter a homes and business in a matter of minutes. Lasting Quality – High Security locks are simply built better. These locks have all brass and steel components inside. There are no diecast pieces that easily break or can be broken by an intruder. Having a lock to secure your door that is built tough is essential. Using a high security lock will ensure that you get the right quality and are properly protected. Use this criteria when purchasing a lock to ensure that the physical security is taken care of first. A burglar’s worst enemy is time so the harder you make it for them to enter the better protected you are. Community Lock & Safe Service, Inc. offers customers a better choice in Locksmith services. 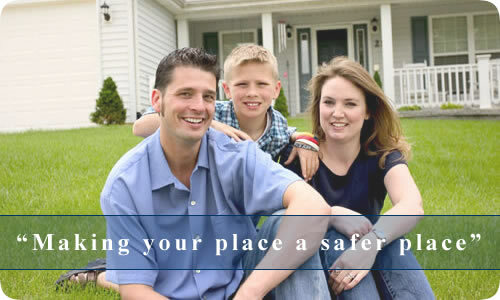 With over 34 years in the business and still family owner Community Lock & Safe Service, Inc. offers its customers the best peace of mind when it comes to protecting their home or business. Community Lock & Safe Service, Inc. is a Orange County based company and specializes in high security locks. To learn more about products, please click here. Does your door stick? Fix it quickly. You’ve got a door that sticks along the “strike area” (the part of the door frame where it meets the outermost edge of the door). No need to do anything drastic. Instead, pull out a Philips screwdriver and do this fast fix. In 9 out of 10 times, this will fix your problem. Determine where the sticking is happening. If the sticking area is along the door frame where the hinges are located, this fix will not work. If it is happening along the top edge of the doorframe, this fix will only make the situation worse. This fix only works along the edge of the door frame where the strike-plate is located. Now, precisely where on this part of the doorframe does the sticking occur? On the top, middle, or bottom? Most times, you’ll find that the door sticks along the top because the door is sagging. Using your Philips screwdriver, tighten the screws of either the top, middle, or bottom hinge. Tighten the screws that go into the door and the screws that go into the door frame. Don’t over-tighten the screws or you may strip/break them. In most cases, the problem is now fixed. If not, tighten the screws in the other two hinges. Note: I prefer to use a hand screwdriver for better control with these tiny hinge screws that are prone to breaking. If you use a cordless drill or driver, be sure to set the clutch very low so that you do not risk stripping or breaking the screws. If the screws are stripped out, remove the screw and fill the holes with wood tooth picks and then reinstall the screws. This trick works every time. Need a Locksmith around Orange County, North Orange County or Yorba Linda? Contact Community Lock & Safe Service, Inc.
Community Lock & Safe Service, Inc. is the ultimate resource for security consultation, equipment, installation and maintenance all at a competitive price. We are a licensed contractor proudly serving the cities of Brea, Fullerton, Orange, Anaheim, Irvine and Santa Ana. While we are licensed, many are not and list their locksmith permit number as their license number. We believe it is important for customers to deal with a locksmith that has a physical location of business and to ensure quality workmanship and accountability. Come by our shop today or call 24 hours a day for mobile service. You can rely on Community Lock & Safe Service, Inc. – to be your Security Professionals!